To Cite: Resendiz-Nava C, Esquivel-Hernandez Y, Alcaraz-Gonzalez A, Castaneda-Serrano P, Nava G M. PCR Assays Based on invA Gene Amplification are not Reliable for Salmonella Detection, Jundishapur J Microbiol. 2019 ; 12(2):e68764. doi: 10.5812/jjm.68764. Background: Salmonella surveillance relies on invA polymerase chain reaction (PCR) assays for the rapid detection of Salmonella; however, false-positive results have been reported using this method. Objectives: To evaluate the performance and specificity of the published and validated PCR protocols targeting invA gene for the detection of Salmonella. Methods: The performance and specificity of 11 different PCR primer sets were evaluated using Salmonella type strains and Citrobacter spp., Escherichia coli and Serratia spp. isolates recovered during a Salmonella surveillance program. Results: It was revealed that the published PCR protocols using validated primers targeting invA and 16S rRNA genes generated false-positive signals. Importantly, a protocol targeting the ttrA/C genes was able to discriminate Salmonella and non-Salmonella isolates. Conclusions: Detection of Salmonella spp. by means of invA PCR amplification is not reliable. In fact, false-positive results are commonly obtained from Citrobacter, E. coli and Serratia isolates. It is recommended to use other loci, such as ttrA/C genes, for the accurate and reliable detection of Salmonella. Salmonella is an important pathogen transmitted through food, water or direct contact with animals. Most Salmonella surveillance programs rely on polymerase chain reaction (PCR)-based assays for rapid and accurate detection (1, 2). Among these molecular tools, the invA-PCR assay has been accepted as the conventional method for Salmonella detection (2-4). This PCR protocol amplifies a fragment of the invA gene, a Salmonella-specific locus (5, 6) proposed as an international standard tool for the accurate detection of this pathogen (7). Nearly, 7,000 scientific reports have used invA PCR assays for Salmonella detection and ~ 450 of them were published in 2018 (as of December) (8). Nevertheless, some reports have described the occurrence of false-positive results (5, 7, 9, 10). The main goal of the present study was to evaluate the performance of previously published invA PCR assays using a collection of isolates obtained from a Salmonella surveillance program. School of Chemistry Biosafety Committee revised and approved the experiments under project #FQ-2017-01. Salmonella enterica type strains (ATCC 140028, ATCC 700720, ATCC 23595, ATCC 14028 and ATCC 13076), Citrobacter spp., Escherichia coli, Enterobacter sp., Serratia sp., Hafnia sp. and Aeromonas sp. isolates were retrieved from our frozen-glycerol stock collection. This collection comprises more than 400 bacterial isolates obtained during a Salmonella surveillance program for poultry meat. All the selected isolates were grown overnight in Tryptic soy broth at 35°C to reach a concentration of ~ 4 × 109 CFU/mL. After incubation, one milliliter of the culture was used for genomic DNA extraction (Quick-DNA Miniprep Plus Kit, Irvine, CA). Genomic DNA from the selected isolates was subjected to invA PCR amplification using seven previously published primer sets (5, 11-14) and targeting the invA gene (STM2896; Table 1). When the published protocols generated non-specific amplicons, gradient PCR (temperature range: 41 - 64°C) was performed to identify optimum annealing temperatures. Reactions were carried out using maxima hot start Taq DNA polymerase (Thermo Fisher Scientific, Waltham, MA) and 5.0 ng/µL of purified DNA. The optimized PCR protocols consisted of an initial denaturation at 94°C for 3 minutes, 35 cycles of: desaturation at 94°C for 30 secods, annealing at 53 - 69.3°C for 30 seconds (Table 1), extension at 72°C for 30 seconds and a final extension at 72°C for 3 minutes. Specificity of the PCR method was analyzed on 1.5% agarose gel. To improve the discriminatory power of PCR protocols, alternative Salmonella-specific PCR assays were performed. Four additional primer sets (16SF1 + 16SIII, MINf + MINr, STM3098-f2 + STM3098-r2, and ttr-6 + ttr-4) were evaluated using protocols published elsewhere (15-18) (Table 1). Similarly, gradient PCR was carried out to identify optimum annealing temperatures. PCR protocols were carried out as described above with annealing temperatures described in Table 1. Specificity of the PCR methods was analyzed on 1.5% agarose gel. During a Salmonella surveillance program, it was observed that some bacterial isolates generated false-positive signals using the conventional invA PCR assay (5); thus, it was decided to evaluate the performance of other published primers targeting the invA gene. Using a collection of Citrobacter spp., E. coli and Serratia sp. 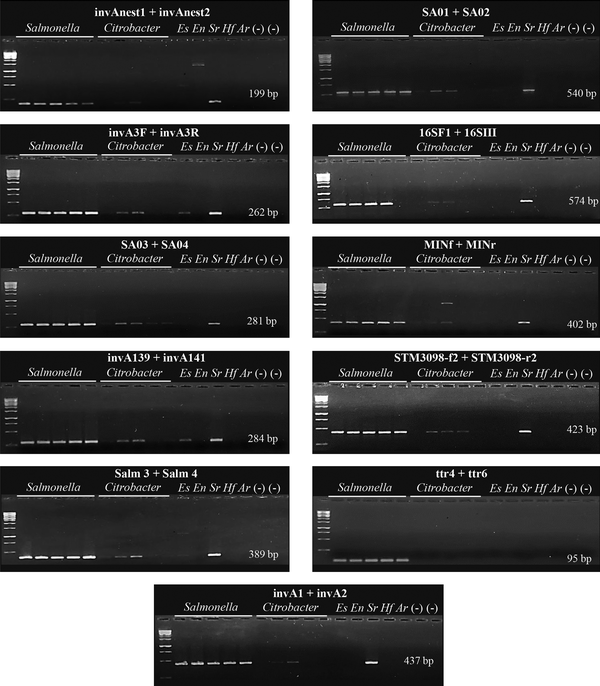 recovered from poultry meat, it was revealed that all the selected invA gene primers generated non-specific signals (Figure 1); comparable results have been reported in reactions containing genomic DNA from non-Salmonella isolates (5, 7, 9, 10). Recent studies have reported a high specificity for invA PCR assays (19, 20); however, these analyses were carried out using DNA obtained from type strain collections. The advantage of the present study was that field isolates known to generate conflictive results were used to evaluate the specificity of the assays. Overall, the results of the present study indicate that PCR assays based on invA gene amplification are not reliable for Salmonella detection. Taking advantage of this collection of isolates, the performance of the other four additional primer sets was evaluated. Primers pairs 16SF1 + 16SIII and MINf + MINr targeting the 16S rRNA gene generated non-specific signals in reactions containing Citrobacter spp. and Serratia sp. DNA, even after gradient PCR was performed (Figure 1). This lack of specificity has been reported in other studies (15, 21) and could be caused because primer sets 16SF1 + 16SIII and MINf + MINr target the V3 region of the 16S rRNA, a segment with a high level of homology between members of the Salmonella, Citrobacter and Enterobacter genera (21, 22). Also, the primer set STM3098-f2 + STM3098-r2 targeting locus STM3098, a genomic region coding for a putative transcriptional regulator (17), generated non-specific signals in reactions containing Citrobacter spp. and Serratia sp. DNA (Figure 1). To the best of our knowledge, only one study has evaluated the specificity of this primer set, showing a high specificity against 37 non-Salmonella isolates; however, these isolates belonged to type strain collections (23). These results highlight the importance of using field isolates during PCR protocol validations. The present study also revealed that the primer set ttr-6 + ttr-4 targeting the ttrA/C genes (tetrathionate reductase subunit A/C) was able to discriminate between S. enterica and non-Salmonella isolates (Figure 1). Comparable results were reported using a set of 110 S. enterica strains, representing 38 different serovars and 87 non-Salmonella strains (18). Importantly, the primer set ttr-6 + ttr-4 has shown to be an excellent molecular target for quantitative assays (e.g., qPCR) due to its high specificity and amplicon size (~ 90 bp) (24, 25). In sum, the results of the present manuscript indicate that PCR assays based on invA gene amplification are not reliable for Salmonella detection. False-positive results are commonly obtained from Citrobacter spp., E. coli and Serratia sp. isolates. Other loci, such as ttrA/C genes, should be used for the accurate and reliable detection of this pathogen. Figure 1. Performance evaluation of PCR assays for Salmonella detection. Representative PCR reactions using Salmonella enterica type-strains and isolates recovered from poultry meat samples. Eleven primer sets targeting the invA (invA1 + invA2, invAnest1 + invAnest2, invA3F + invA3R, SA01 + SA02, SA03 + SA04, invA-139 + invA-141 and Salm 3 + Salm 4), 16S rRNA (16SF1 + 16SIII and MINf + MINr), STM3098 (STM3098-f2 + STM3098-r2) and ttrA/C (ttr-6 + ttr-4) genes were evaluated against Salmonella enterica type-strains (placed in this order: ATCC 140028, ATCC 700720, ATCC 23595, ATCC 14028 and ATCC 13076), Citrobacter spp., Escherichia coli (Es), Enterobacter sp. (En), Serratia sp. (Sr), Hafnia sp. (Hf), Aeromonas sp. (Ar). Authors' Contribution: Carolina Resendiz-Nava and Yajaira Esquivel-Hernandez performed the experiments; Alejandro Alcaraz-Gonzalez collected the samples and obtained bacterial isolates; Carolina Resendiz-Nava, Pilar Castaneda-Serrano, and Gerardo M Nava designed the experiments and wrote the manuscript. All the authors revised and approved the manuscript. Conflict of Interests: The authors declare that there is not conflict of interest. Financial Disclosure: The authors declare that they had no financial disclosure. Funding/Support: This study was supported, in part, by grant FOFIUAQ-2018-12919. 1. Bell RL, Jarvis KG, Ottesen AR, McFarland MA, Brown EW. Recent and emerging innovations in Salmonella detection: A food and environmental perspective. Microb Biotechnol. 2016;9(3):279-92. doi: 10.1111/1751-7915.12359. [PubMed: 27041363]. [PubMed Central: PMC4835567]. 2. Kasturi KN, Drgon T. Real-time PCR method for detection of Salmonella spp. in environmental samples. Appl Environ Microbiol. 2017;83(14). doi: 10.1128/AEM.00644-17. [PubMed: 28500041]. [PubMed Central: PMC5494621]. 3. Hu J, Huang R, Wang Y, Wei X, Wang Z, Geng Y, et al. Development of duplex PCR-ELISA for simultaneous detection of Salmonella spp. and Escherichia coli O157: H7 in food. J Microbiol Methods. 2018;154:127-33. doi: 10.1016/j.mimet.2018.10.017. [PubMed: 30393180]. 4. Truitt LN, Vazquez KM, Pfuntner RC, Rideout SL, Havelaar AH, Strawn LK. Microbial quality of agricultural water used in produce preharvest production on the Eastern Shore of Virginia. J Food Prot. 2018;81(10):1661-72. doi: 10.4315/0362-028X.JFP-18-185. [PubMed: 30212229]. 5. Rahn K, De Grandis SA, Clarke RC, McEwen SA, Galan JE, Ginocchio C, et al. Amplification of an invA gene sequence of Salmonella typhimurium by polymerase chain reaction as a specific method of detection of Salmonella. Mol Cell Probes. 1992;6(4):271-9. doi: 10.1016/0890-8508(92)90002-F. [PubMed: 1528198]. 6. Laing CR, Whiteside MD, Gannon VPJ. Pan-genome analyses of the species Salmonella enterica, and identification of genomic markers predictive for species, subspecies, and serovar. Front Microbiol. 2017;8:1345. doi: 10.3389/fmicb.2017.01345. [PubMed: 28824552]. [PubMed Central: PMC5534482]. 7. Malorny B, Hoorfar J, Bunge C, Helmuth R. Multicenter validation of the analytical accuracy of Salmonella PCR: Towards an international standard. Appl Environ Microbiol. 2003;69(1):290-6. doi: 10.1128/AEM.69.1.290-296.2003. [PubMed: 12514007]. [PubMed Central: PMC152403]. 8. [No Authors Listed]. Google Scholar search using terms: Salmonella + PCR + invA + detection. 2018. Available from: https://scholar.google.com. 9. Arnold T, Scholz HC, Marg H, Rosler U, Hensel A. Impact of invA-PCR and culture detection methods on occurrence and survival of salmonella in the flesh, internal organs and lymphoid tissues of experimentally infected pigs. J Vet Med B Infect Dis Vet Public Health. 2004;51(10):459-63. doi: 10.1111/j.1439-0450.2004.00808.x. [PubMed: 15606871]. 10. Scholz HC, Arnold T, Marg H, Rosler U, Hensel A. Improvement of an invA-based PCR for the specific detection of Salmonella typhimurium in organs of pigs. Berl Munch Tierarztl Wochenschr. 2001;114(9-10):401-3. doi: 10.31274/safepork-180809-1193. [PubMed: 11570189]. 11. Liu T, Liljebjelke K, Bartlett E, Hofacre C, Sanchez S, Maurer JJ. Application of nested polymerase chain reaction to detection of Salmonella in poultry environment. J Food Prot. 2002;65(8):1227-32. doi: 10.4315/0362-028X-65.8.1227. [PubMed: 12182472]. 12. Cheng CM, Lin W, Van KT, Phan L, Tran NN, Farmer D. Rapid detection of Salmonella in foods using real-time PCR. J Food Prot. 2008;71(12):2436-41. doi: 10.4315/0362-028X-71.12.2436. [PubMed: 19256088]. 13. Vazquez-Novelle MD, Pazos AJ, Abad M, Sanchez JL, Perez-Paralle ML. Eight-hour PCR-based procedure for the detection of Salmonella in raw oysters. FEMS Microbiol Lett. 2005;243(1):279-83. doi: 10.1016/j.femsle.2004.12.016. [PubMed: 15668030]. 14. Cocolin L, Manzano M, Cantoni C, Comi G. Use of polymerase chain reaction and restriction enzyme analysis to directly detect and identify Salmonella typhimurium in food. J Appl Microbiol. 1998;85(4):673-7. doi: 10.1111/j.1365-2672.1998.00575.x. [PubMed: 9812379]. 15. Lin CK, Tsen HY. Use of two 16S DNA targeted oligonucleotides as PCR primers for the specific detection of Salmonella in foods. J Appl Bacteriol. 1996;80(6):659-66. doi: 10.1111/j.1365-2672.1996.tb03271.x. [PubMed: 8698667]. 16. Trkov M, Avgustin G. An improved 16S rRNA based PCR method for the specific detection of Salmonella enterica. Int J Food Microbiol. 2003;80(1):67-75. doi: 10.1016/S0168-1605(02)00138-1. [PubMed: 12430773]. 17. Kim HJ, Park SH, Kim HY. Comparison of Salmonella enterica serovar Typhimurium LT2 and non-LT2 salmonella genomic sequences, and genotyping of salmonellae by using PCR. Appl Environ Microbiol. 2006;72(9):6142-51. doi: 10.1128/AEM.00138-06. [PubMed: 16957240]. [PubMed Central: PMC1563604]. 18. Malorny B, Paccassoni E, Fach P, Bunge C, Martin A, Helmuth R. Diagnostic real-time PCR for detection of Salmonella in food. Appl Environ Microbiol. 2004;70(12):7046-52. doi: 10.1128/AEM.70.12.7046-7052.2004. [PubMed: 15574899]. [PubMed Central: PMC535175]. 19. Heymans R, Vila A, van Heerwaarden CAM, Jansen CCC, Castelijn GAA, van der Voort M, et al. Rapid detection and differentiation of Salmonella species, Salmonella Typhimurium and Salmonella Enteritidis by multiplex quantitative PCR. PLoS One. 2018;13(10). e0206316. doi: 10.1371/journal.pone.0206316. [PubMed: 30359449]. [PubMed Central: PMC6201931]. 20. Bai J, Trinetta V, Shi X, Noll LW, Magossi G, Zheng W, et al. A multiplex real-time PCR assay, based on invA and pagC genes, for the detection and quantification of Salmonella enterica from cattle lymph nodes. J Microbiol Methods. 2018;148:110-6. doi: 10.1016/j.mimet.2018.03.019. [PubMed: 29621581]. 21. Lin CK, Hung CL, Hsu SC, Tsai CC, Tsen HY. An improved PCR primer pair based on 16S rDNA for the specific detection of Salmonella serovars in food samples. J Food Prot. 2004;67(7):1335-43. doi: 10.4315/0362-028X-67.7.1335. [PubMed: 15270483]. 22. Ceuppens S, De Coninck D, Bottledoorn N, Van Nieuwerburgh F, Uyttendaele M. Microbial community profiling of fresh basil and pitfalls in taxonomic assignment of enterobacterial pathogenic species based upon 16S rRNA amplicon sequencing. Int J Food Microbiol. 2017;257:148-56. doi: 10.1016/j.ijfoodmicro.2017.06.016. [PubMed: 28666129]. 23. Park SH, Kim HJ, Cho WH, Kim JH, Oh MH, Kim SH, et al. Identification of Salmonella enterica subspecies I, Salmonella enterica serovars Typhimurium, Enteritidis and Typhi using multiplex PCR. FEMS Microbiol Lett. 2009;301(1):137-46. doi: 10.1111/j.1574-6968.2009.01809.x. [PubMed: 19843307]. 24. Kloska F, Casteel M, Kump FW, Klein G. Implementation of a risk-orientated hygiene analysis for the control of Salmonella JAVA in the broiler production. Curr Microbiol. 2017;74(3):356-64. doi: 10.1007/s00284-017-1199-9. [PubMed: 28138784]. 25. Sebastiani C, Curcio L, Ciullo M, Cruciani D, Crotti S, Pesca C, et al. A multi-screening Fast qPCR approach to the identification of abortive agents in ruminants. J Microbiol Methods. 2018;148:12-7. doi: 10.1016/j.mimet.2018.03.009. [PubMed: 29574004].